← Day 90: Art Battle Toronto. 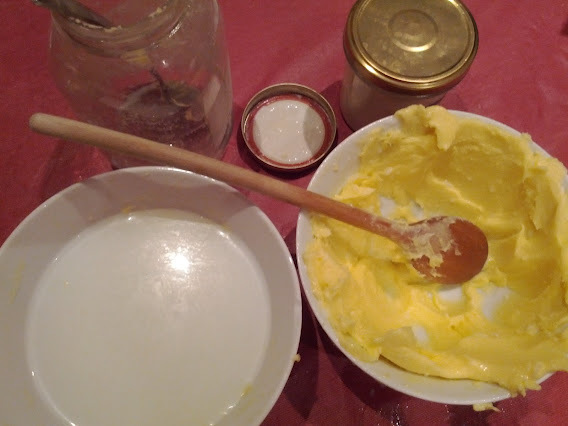 Day 91: Make Butter in a Jar. The three secrets to French cooking, a sultry Catherine Zeta-Jones purred in the chick flick ‘No Reservations‘, are butter, butter, and butter. From shortbread to biscuits, and sautéed prawns to candied carrots, there are few things in life that don’t taste better with butter. I won’t even get started on its fundamental importance to making a proper grilled cheese sandwich or caramel sauce. 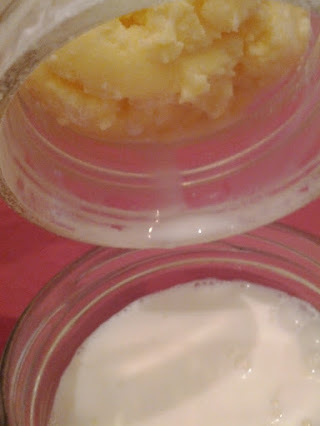 For these reasons and oh so many more, you can imagine my delight when I came across this relatively simple way to make my own homemade butter in a mason jar. It involved a whole lotta shaking, and that’s about it. My curiosity was officially piqued. 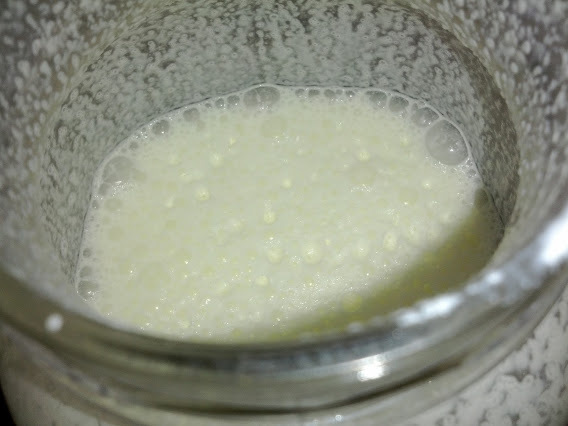 I started off by pouring heavy cream into the jar, fastening the lid tightly, and then shaking for what felt like hours, but what was probably a matter of minutes. Early on during these good vibrations, LeLa offered up what seemed to be a brilliant suggestion. Why not let the Ultra Vibe machine do the shaking for me? While this did prove to be an entertaining distraction for a bit, it was unfortunately insufficient in fully gyrating the cream. Alas, back down to the kitchen we went. Eventually, persistence did pay off, and I started to notice some changes in the cream’s texture. 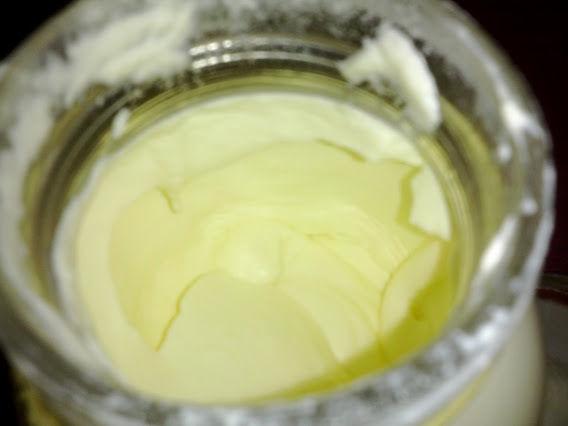 As advertised, it passed through a myriad of stages, including a frothy whipped cream, a smooth and silky cream, and an almost solid jar of whipped butter. And that’s when it happened. 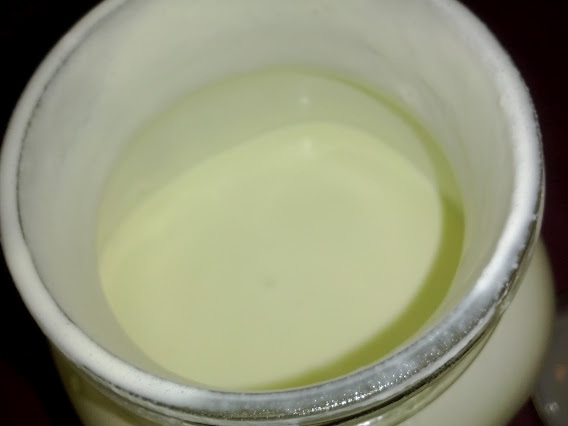 Almost instantaneously, like a phoenix rising from sodden ashes, a lump of something faintly recognizable as yellow butter magically appeared in the jar. It was as though it had spontaneously renounced the buttermilk, like some kind of religious exorcism where the butter was part of the holy kingdom, and the buttermilk was the devil’s juice… Or something like that. Overdramatic? Who, moi? The next step involved draining the buttermilk, which proved to be fairly straightforward. Thoughts of fluffy, buttermilk pancakes immediately started dancing through my head. A pressing question then emerged: did we have enough maple syrup? Oh, and buckwheat would be fantastic, as would a nice strawberry sauce. Hmm… Local strawberries hadn’t appeared on the scene quite yet, so that would have to wait. I hoped the buttermilk wouldn’t sour in the interim. I wondered if it could be frozen? 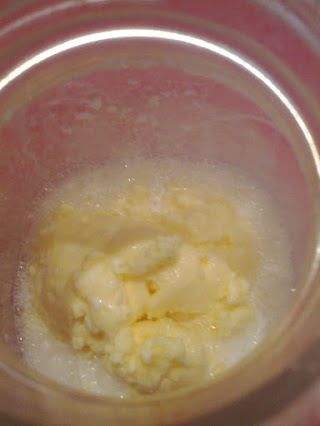 …And, just like that, I was back in my butter-making reality. I re-read the next step in the recipe. Wash the butter? What the?!? Apparently, leaving any buttermilk in the butter makes it go rancid very quickly, and that is, well, bad. So, I then undertook a process of trying to squeeze it all out with the back of a wooden spoon as I transferred it back and forth from another bowl full of chilled water. I think I tried this a few times until the novelty had worn off and I convinced myself that we could consume the resulting amount of butter within a few days, so the rancid risk was sufficiently mitigated. If not, well, I could always make some sugar cookies to marry the butter with something equally bad for our health and yet delightful on the palate. I was done. 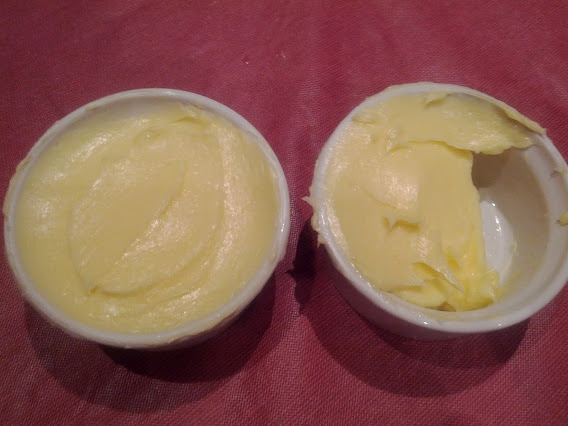 Butter I am, because eat it, I did. The seemingly miraculous appearance of the butter had left me incredibly proud of this particular accomplishment, so I felt compelled to celebrate with a couple of slices of toast, sprinkled with a little sea salt. The verdict? Delicious! Unlike Mythbusters, I encourage you all to try this at home, particularly if you have children and you’re looking for something fun yet practical to do on a rainy day. Or maybe you just need more butter around the house because of its many other applications, like unsticking your hands after crafting, oiling a squeaky door when you’re out of WD-40, shining up your leather, swallowing your pills, moisturizing your dry hair, lathering up skin for a shave, and, of course, getting that ring off of your finger. Or for finally getting around to carving that yoda butter statue you’ve always wanted. Hint: you’re going to need more jars. 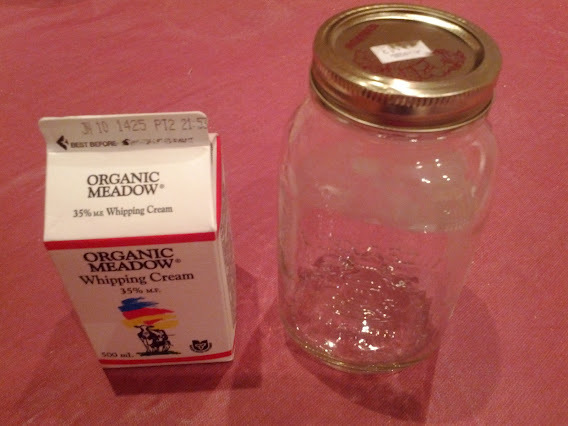 This entry was posted in Food and Drink, Home and Personal and tagged Drink, Food, heavy cream, Home, homemade, Make Butter in a Mason Jar, May, No Reservations, Personal. Bookmark the permalink.